Ellen Chigamba has taken the tough decision of taking lifesaving antiretrovirals (ARVs) medication on an empty stomach. As our reporter BOBBY KABANGO finds out in this three part series, she is between a rock and hard place due to poverty. Should those diagnosed with HIV but are too poor to buy food on a regular basis not take the medication on an empty stomach? She lives near Sanjika Palace in Blantyre. If you are driving, her house is less than 20 kilometres off the main road in a small village on the outskirts of Blantyre called Chidyangula in Group Village Headman Mpagaja, Traditional Authority (TA) Somba. Ellen Chigamba was diagnosed with HIV in 2012 at age 28. Two years later, she was divorced, her husband abandoned her for another woman. Today, at 35, she is a single mother to four children aged between 6 and 18. When she was diagnosed with HIV in 2012, doctors recommended her to start receiving multiple antiretroviral (ARV) drugs in an attempt to control HIV infection. At first, it was easy as the husband provided for her family. When he left in 2014, life became difficult. Because she is often weak and sometimes ill, her small garden behind her small mud and grass-thatched house lies neglected. For example, last year she could not produce enough food for the family. Chigamba, looking weak and panting heavily, said she harvested a 50 kilogramme bag of maize only. She adds that fall armyworms and poor rains also affected the harvest. The day we visited her on February 6, she had gone four nights on an empty stomach due to lack of food. “I have had nothing for days. There is no food to feed the children and myself. Tikati tadya ndekuti ndi mkhwani [we often cook and eat pumpkin leaves]” she says. Most families in the area and across the country depend on maize for food. For Chigamba, a full meal [nsima] is expensive so she takes pumpkin leaves once a day. “As a single mother, it is difficult to feed four children. I am not working, the only solution I have is to make and sell charcoal to buy food,” she says. She is beginning to question if she has to continue taking her medication on an empty stomach. Chigamba takes four tablets a day. “The drugs are taking a toll on my body. I feel drowsy and hollow inside the stomach after taking the medication. It takes me almost two hours to feel normal again,” she says, looking pale. It takes seconds for her to respond to our questions. Her life seems to be in danger. But Chigamba is not alone in this predicament. 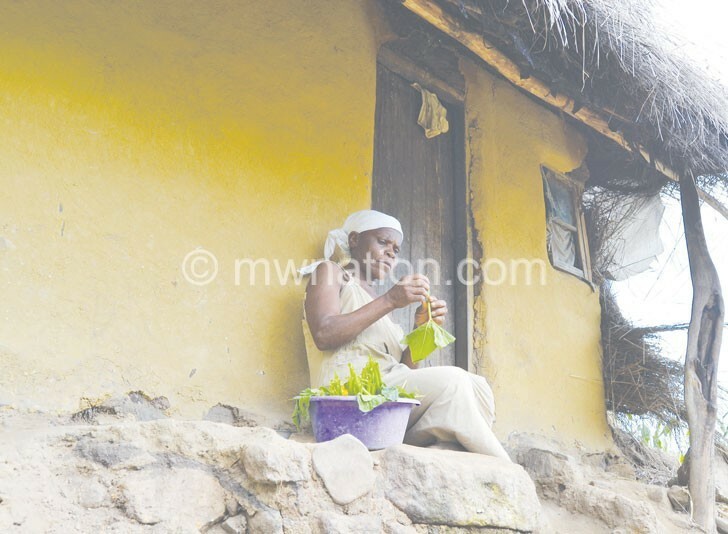 A stone throw away from her house is another patient on ARVs. She is Margret Mabvuto, 55, with three children. She is from Chikhomo village. We found Mabvuto preparing pumpkin leaves for supper. She takes maize flour porridge once a day because she cannot afford to have nsima for lunch and supper. She is married but her husband is unemployed. He brings food on the table by doing menial jobs in the city. On this day, her home had no food. “My husband left home in the morning in search of ganyu [piece work] in order to buy maize flour. It is now around 4pm, and as you can see, he has not returned. “I don’t think he will get anything and this is why I am preparing pumpkin leaves for dinner,” she says, looking defeated. Mabvuto says her husband is also on ARV treatment. 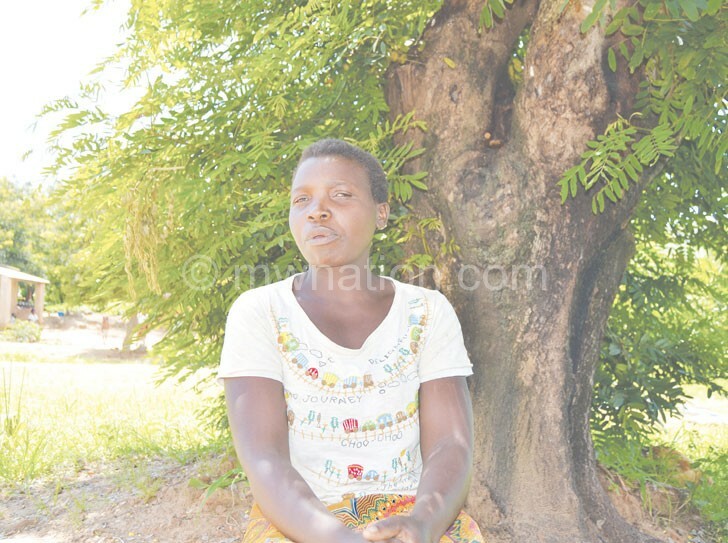 “I feel sorry for us, he is such a caring husband and he does everything possible to bring home food but life is too hard and maganyu akusowa [menial work is hard to get by],” she says. Mabvuto says her husband left home in the morning without taking any food. “When he is back, he is supposed to take drugs. If he does not find money for food he might take the drugs without food that’s why I have to prepare something for him to eat,” she explains. Group Village Headman Mpagaja says he is aware of the situation facing patients on ARV treatment. Mpagaja said she sought the intervention of the member of Parliament (MP) in the area and even appealed to government officials to support people who are lacking adequate food in her area but the pleas have been falling on deaf ears. “The most challenged people are those who are on treatment. They are spending days without food but still they need to take drugs,” she said. The chief said her village has 189 families, with about 347 people. According to her, 78 families are in need of food. A few days later, the chief says the woman died and she left three kids in the care of the family members. Mpagaja says her village has about 30 people who are on ART treatment all of whom struggle to get food. Clinical epidemiologist at Helse Nord HIV/Aids and Tuberculosis (TB) Research Initiative (HNTI) at University of Malawi’s College of Medicine, Titus Divala warns that food insecurity is a threat to general health including success in HIV management in the country. “Fighting HIV in the human body depends on being healthy. Food insecurity leads to malnutrition, which on its own is a recipe for weakened immune system to fight HIV,” he says. “Remember, ART comes in to help the body fight the disease and this works best if someone is already strong that’s well-nourished and with all the key nutrients in place. Having HIV and being food insecure is a situation we should not allow as it complicates the health of the patients,” explains Divala. He says studies of HIV positive people in difficult food circumstances in Uganda, South Africa, Botswana and Western nations have shown some connections between food insecurity and failure to secure the full benefits from the ART. The studies show that food insecurity is a common reason for people to stop taking ART. One study shows that ARVs increase appetite and lead to intolerable hunger in the absence of food. “Side effects of ARVs were exacerbated in the absence of food. Patients believed they should skip doses or not start on ARVs at all if they could not afford the added nutritional burden. “Competing demands between costs of food and medical expenses led people either to default from treatment, or to give up food and wages to get medications. While working for food for long days in the fields, patients sometimes forgot medication doses,” reads the report in part. Divala says that is why some ARVs require consumption with food to limit side effects. The World Health Organisation (WHO) recommends that energy requirements of HIV-infected individuals increase by about 10 per cent from the time of infection and by 20 percent to 30 when chronic opportunistic infections or HIV-specific conditions are present. The WHO also recommends that HIV-infected patients should be assured of at least one recommended daily allowance of most vitamins which is not the case with Chigamba and Mabvuto. In the absence of an adequate diet, this often means that HIV care and treatment programmes must supply multiple micronutrient preparations.“The second important link between HIV and nutrition is the growing realisation that food insecurity may increase HIV risk transmission behaviours and susceptibility to HIV once exposed,” warns the WHO report.